This article demonstrates how cultural dispossession preventing the Polish marginalized from collective action can be reversed by organizations, which mobilize the grassroots. Based on the case of mobilization within Warsaw tenants’ movement, Kasia Gajewska analyzes the process of mobilisation, the role of the organisations in it, and the profile of the organisers. In his ethnographic study, Kalb (2009) demonstrates how Polish citizens are dissuaded from protesting by the media and the elites, which diffuse a negative image of protest and the working class. He draws upon Buchowski’s (2006) concept of orientalisation, a discourse employed by intellectual elites depicting the working class as uncivilised and fighting for a wrong cause. According to Kalb, the cultural discrimination of voice led to the rise of populist parties in Poland.. New Left organisations may be exclusive and do not engage in mobilisation of the grass-roots which perpetuates cultural dispossession as a result (cp. Gajewska 2014). Ost (2005) illustrates another example of how trade unions have dissuaded workers from mobilisation in Poland. While the cultural environment and the media are important factors demobilising society, mobilisation is planned and organised through personal interactions and organisations . Deriving from micro-mobilization theory (McAdam 1988), one could expect that insufficient performance of institutions could actually lead to mobilization given that other conditions for mobilization are present, such as framing or leadership. The importance of organizations has been also illustrated with the case study on the Hungarian radical right. The organizational structures initiated by Victor Orban in 2002, which gave common people the possibility to engage and make friends are seen as one of the reasons why the radical right, first Fidesz and then the Jobbik party, have been successful in Hungary, (Halmai 2011). Urban movements constitute a new form of civil society organizations and realizing citizenship, acting as service providers, self-help groups, and grassroots mobilizers (Jacobsson & Saxonberg 2013). Although much less numerous than party-supported protest, local level collective actions around socio-economic rights turned out to be very frequent in protest event analysis in Ukraine (Ishchenko 2011). I present here an event where tenant activists organize and mobilize tenants to participate in a demonstration. This will illustrate how the cultural context of mobilization can be re-framed in personal interactions and mobilization. The background of activists mobilizing the marginalized will be described in the second part of the article. Between September 2009 and May 2012, I conducted in-depth, semi-structured group interviews both with the tenants involved in collective actions and the organizers.. In total, I conducted interviews with four Warsaw-based organizations: two tenants’ organizations, an organization that organized one of them, and an organization helping to defend citizens’ rights, which are often tenants’ problems. Furthermore, I conducted two observations of meetings between organizers and people outside of organizations in September and November 2009, and participated in an eviction blockade in May 2012. The background on tenants’ situation was drawn from interviews, review of websites on the topic, and publications edited by the activists involved in the issue. I also reviewed mainstream newspapers for comparison. In the transition years, the housing shortage was perceived by the incumbents. Responsibilities over state housing were transferred to local government in the late 1990s. The state has withdrawn from new construction, leaving it to the private sector, and has not renovated the old stock (Kopstein 2000: 9ff.). The privatization of the housing and high rents is not sufficiently counterbalanced by the state welfare provisions. The financial measures support better-off citizens by providing subsidies for mortgage or supporting housing cooperatives, in which participation and rents are relatively expensive. Tenants encounter difficulties because of corruption, incompetence, or indifference of state housing administration. To sum up, the insufficient provision of the living space by the state, lacking law enforcement and control by and of the administration are the main grievances held by tenants. The decision-making on housing provision and managing housing stock takes place on the local level. One can also observe a shift of this political and redistribution issue to the executive, usually an invisible realm of direct interactions between public administration and citizens. The interpretation of law and its implementation into practice is often inconsistent or arbitrary, which requires a different form of citizen engagement than it is the case in countries, in which law enforcement works well and movements can focus on changing the legislation. In another LeftEast article (Gajewska 2013) and in Grzegorczyk (2008), more details on the tenants’ situation can be found. The collapse of communism was a defining moment for the tenants’ situation and their organizing followed soon after.The first tenant organization, Polish Union of Tenants (Polskie Zrzeszenie Lokatorow, PZL) was established in 1989 in Krakow. Now the organization has local chapters. Its main focus has been on political pressure and legal advice. Its activity concentrated around servicing and not on organizing. In the late 1990s there were nine thousands evictions a year. Piotr Ikonowicz from PPS (Polish Socialist Party) organized blockades of the evictions. The Anarchist Federation, Left Alternative, Federation of the Young in Labour Union party were involved in this actions and PPS supported them with their office space. In the first phase of the movement, it was politicized and used for political aims. The tenants were less involved and they organized mainly in the form of self-help groups. The protesters were considered by tenants to provide a service. The organization of blockades was suspended in 2001 when PPS failed in the elections (Ciszewski 2008). ecent years have brought a new type of organizing, which I will present in-depth. The suspension of rent control in 2004 motivated the campaign ‘Housing is a right not a commodity’ (MPnT) by a network of socio-political groups: mainly the Left Alternative, trade union August 80, Group for a Workers’ Party, New Left party, and the Polish Labour Party. First at the end of 2005, several tenants came to the group to seek legal advice or help with protest. In 2006, tenants from Konduktorska Street joined the MPnT campaign. The owner cut electricity and water in their flats. Since other tenants came to seek help from the group, the organization decided that they need to be organized and the involvement of the parties is less relevant for them. The group allied with an association of tenants of one of the buildings ‘16’. In 2006, the first conference on housing was organized and International Tenants’ Day was accompanied by a demonstration (Ciszewski 2008). Nowadays, Warsaw tenants’ movement consists of organizations focusing on tenants’ issues, associations of tenants from specific buildings, and squatters, who participate in common mobilizations. More information on the movement coalition around housing can be found in the article by Polanska Vergara (2014). The extent of mobilization can be illustrated with protest participation in 2012: some blockades of evictions gathered 100 people, demonstrations for tenant/housing issues – up to 300 people; March demonstration against closing squat ‘Elba’ and against ACTA – 2000 people. Four organizations: Warsaw Association of Tenants (Warszawskie Stowarzyszenie Lokatorow, WSL), Left Alternative (Lewicowa Alternatywa, LA), Committee for Tenant Defense (Komitet Obrony Lokatorow, KOL), Attorney Office for Social Justice (Kancelaria Sprawiedliwości Społecznej, KSS), with similar profile and often cooperating with each other, are empirical base in further analysis. What distinguishes them is the direct involvement of the tenants in mobilization and their active interest in the politicization of marginalized and passive citizens. The micro-mobilization does not take place in a vacuum. The role of organizations and leaders is stressed by the literature on social movements (Benford and Snow 2000; Snow et al. 1986). Political ethnography can incorporate the contradictions, silence, or confusion. The confusion might reflect the contradictions of the tradition and the legal system. The decision to participate is placed within the many contextual factors like the political system, material conditions and cultural factors (cp. Wolford 2007: 32). This section will summarize my observation of the information meeting before a demonstration on the International Tenants’ Day on 2 October 2009, which took place one week before the demonstration. I will also highlight other activities of organizations aimed at mobilizing and activating people. The organizing meeting before the demonstration was moderated by a member of a tenants’ organization, Warsaw Association of Tenants (WSL), who is also an activist in the Left Alternative. He presented the association, its activities and achievements. Ten individuals who came to the meeting found the information on the posters. One asked whether it is worth organizing a demonstration. ‘What are its results?’ she asked. The organizer pointed to the meeting with a minister that took place after the most recent demonstration. It is also a way of signaling that there is a problem. Another possible outcome might be attracting new members with similar problems. There are powerful organizations having contradictory interests. The tenants’ movement is not sufficiently organized and therefore they have lower chances of influencing policy than the investors and developers. He underlined that one of the ways to deal with this situation is citizens’ pressure in the form of mobilization. The participants were wary about the political background of the organization. They seemed to be skeptical towards politics and one even said that she does not want to be ‘misused politically’. The participants discussed possible ways of taking influence: one said that it is about the strength of argumentation. However, it was reposited that one needs to organize. Another organizational aspect raised was the question of potential problems that a person might face because of their participation: an old lady (aged 60-70 years old) was afraid that one might take pictures of hers and mob her afterwards. Another person also pointed to the danger of being perceived as a ‘shipyard trade unionist’ – meaning a person that behaves in an uncivilized way. The latter remark echoes the image of protest in the society and cultural dispossession (cp. Kalb 2009) in the form of prejudices in the society about mobilization. Those were reposted by showing the success of mobilization and history of the organization. The organizer mentioned Swedish tenants’ movement, which is relatively numerous and successful. In this way, the dominant framing of protest as uncivilized was re-framed by associating protest with ‘civilized’ Swedish activists. This interaction and moderated discussion helped tenants in the decision to participate in the demonstration. The second part of the meeting was dominated by technical questions, such as what to tell the media or how to prepare. This illustrates the crucial impact of the organizers and mobilization process, which might help with overcoming the prejudices and beliefs hindering people from participating in demonstrations. The discontent as such might be channeled into action when one is shown what the ways to deal with the system are. Free legal help is another form of mobilizing tenants. Attorney Office for Social Justice (Kancelaria Sprawiedliwości Społecznej, KSS) is open during weekdays. KOL and WSL also organize consultations but less often. The KSS invites people to gatherings where they can recognize the broader context to their problems or proposes individual consultations. KSS’ mobilization strategy consists of helping with individual problems first, then showing the broader context to the individual problems providing a venue for building ties with people in a similar situation. First they help to solve the urgent problem with which they came. Many of their ‘clients’ are in-debt and face an eviction. The organization helps to write official letters, represent them in court, or assist in negotiations with banks or authorities. They also try to integrate the person in the group and engage in mobilization. The organization can be considered a self-help group. The organization mobilizes its contacts to block evictions. KSS has 500 phone numbers in their register to diffuse information about demonstrations. During the eviction blockade that I attended in May 2012, a woman I talked to said that she came to show solidarity because the KSS helped her in her legal problems with her former husband, who uses corruption to escape paying alimonies. She said that one cannot count on anyone, not the state which is corrupt, but on each other. In this section, I will turn to the origins of four inclusive and mobilization oriented organizations. Since they are an exception in the context of a Polish civil society which is not interested in grass-roots mobilization (cp. Gajewska 2014), their origin and their development is interesting. First, I will describe an organization that is led by tenants, WSL. Then I will present an organization that has helped to establish the WSL, the Left Alternative. I will focus on its participatory orientation. Two other cases of KOL and KSS will illustrate further motivations to mobilize and profiles of organizers. The organization Warsaw Association of Tenants was established in 2006. It gathered inhabitants of newly privatized buildings. The main activists see the need to engage in politics and seek allies everywhere: also among real estate owners who have interest in overtaking buildings without tenants and among parliamentarians. Its aim is to pressurize the municipal government in Warsaw to improve the housing provision (Interview Grzegorczyk). The way in which the organization wants to achieve its goals is through media attention and mobilization. The organization does not want to belong to any party and keeps distance from politics. This is because the ideological differences might lead to divisions within the interest group. They do not want to be instrumentalized by a party for its election success (Interview Team of Left Alternative). The initiators observed that the involvement in the WSL has transformed the tenants. At the beginning of its activity, people came to the organization to talk about their individual problems. They were not interested in political action and pressurizing for amendments in the legislation. Tenants’ problems were considered to be their individual fate and not a result of the political system. Discussions on political issues followed. After a while, they understood the necessity of collective action to induce change (Interview Team of Left Alternative). From this story one can recognize that the situation led the tenants to seek or be open for joining such an organization but the initiative of activists having organizational experience helped to establish an organization. Information on the group combines analysis of the website (www.la.org.pl) and interview with the team of LA. The group Left Alternative was established in 1997, and in 2003 it merged with another group, Red Collective, which was formed in 2001. The members were born between 1975 and 1985. The following description encompasses the activities of the group after the merger. They oppose traditional ways of influencing politics. Instead, they aim to help the marginalized and to create bases for deeper change. The goals of changing the system are pursued in small steps and motivated by the belief in change from below. The association leans towards the anarcho-syndicalist tradition of social movements and rejects centralization and bureaucratization of movements and their direct involvement in politics. Furthermore, education is an important element of their activity, in the form of auto-didactic learning, lectures and public panels, promotion of alternative culture, and maintaining the Warsaw Social Library. Left Alternative distances itself from the over-intellectualized left organizations. The organization is practice-oriented; it wants to help those disadvantaged by law, its insufficient enforcement, and injustice of the state or owners. They want to remain apolitical because the ideological issues have split the left scene in Poland for years. The concentration on the real problems of the people helps to build a movement from below. The new model of activity and repertoire of action evolved over time as a result of the learning process and experience with the political system. The goal is not to get political support or access to decision making but to educate people. The attitude towards parties is worth further elaboration. The organizers criticize parties for being instrumental about people’s participation in order to pursue their electoral goals. They do not want to serve parties. After the mobilization meeting I have described above, one of the activists warned other activists that one of the participants might be interested in attracting people to his party. Furthermore, the activists referred to attempts of the parties to use the movement for their instrumental goals. Skepticism towards parties reflects general trends within the social movements and activists nowadays: the philosophy of the politics ‘from below’, mistrust towards parties and institutional politics are characteristic of the alter-globalization movement and the European Social Forum participants (della Porta 2008); and consistent with the overall skepticism to the traditional forms of participation channeled by the incumbents (Norris 2002). Due to its participatory orientation, the organization is very inclusive. For instance, many left-oriented organizations would exclude people with anti-Semitic views. The LA activists understand the origin of such attitudes. In their view, people can transform through participation in the movement. The organization sees it as the only chance of activating those people who would not be mobilized otherwise. Because of this, people coming to the organization have no bad experiences with other organizations like trade unions or political parties, which is a chance of involving them in political activity and teaching participatory democracy and mobilization from below (Interview Team of Left Alternative). The organization, Committee for Tenants’ Defense, has a similar profile to the WSL but is mainly concentrated on Warsaw’s Praga district. It was established in 2008. The scope of the activity has extended to other realms of the problems connected to the housing and living space, with which tenants come to the organization. The organization is active in cases of evictions and monitors the activity of state officials and administration. Through pressure on the administration, they want to change their attitudes towards citizens. Furthermore, they monitor the re-privatization process of the real estates. Through the pressure and revealing of criminal practices, they want to curb this type of behavior. 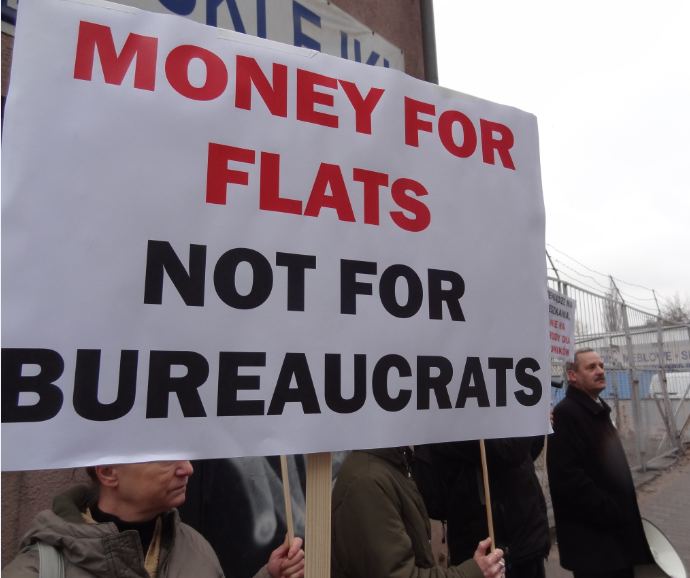 The organization started a campaign on empty flats and renovations. They are monitoring free living space and whether the declared by the administration renovations indeed have taken place. This initiative is based on engagement with tenants who provide information on their buildings and the neighborhood. The team of the organization stressed the importance of mobilizing people and mitigating their fear and uncritical perception of the state bureaucracy. The aim of the organization is to end the feeling of helplessness amongst the tenants and make them aware that they can change the situation through active involvement. They want to provide knowledge and skills to defend one’s rights in case of the misconduct of the officials and bureaucrats. The organization does not support any party and is ideologically inclusive. KOL and an anarcho-syndicalist trade union embracing participatory democracy, Union of Polish Syndicalists (ZSP) share location and they support each other in protest actions. For instance, tenants participated in a demonstration against firing one of the activists from work. In January 2011, an Association Tenant Action Wroclaw (Stowarzyszenie Akcja Lokatorska Wroclaw) was established with the help of a local branch of ZSP in Wroclaw (a city in Poland). This example shows how the resources of anarcho-syndicalist trade union helped to establish other organizations. It also confirms that the politics of workplace and living space can be united into social movement coalition (cp. Collins 2012). The KSS was established in 2006 by New Left party and tenants from Minsk Mazowiecki (Ciszewski 2008). In contrasts to the organizations described above, which are skeptical towards party politics and want to organize citizens in other ways, the KSS considers its activity as step towards building a left party. The organization was established by Piotr Ikonowicz, one of the leaders of Polish Socialist Party (PPS) and the New Left party (established in 2003), who has been active in politics since the 1980s. He used to be a member of Polish Parliament and is trying to build a new left party. The inception of the organization was a result of party activity. Many people asked for help to deal with problems caused by malfunctioning of the administration. Mainly his life partner together with some other volunteers provide legal advice and assistance in dealing with authorities for free. There is no paid staff in the organization. They support their organization from donations. They make their living with writing and translations. The organization has got funding from a liberal politician, Janusz Palikot, founder of a centrist party, Ruch Palikota, which won 9, 94 percent votes in 2011 elections. Some members of this party have involved in tenants’ concerns by participating in demonstrations, eviction blockades, or proposing a monitoring of privatization in Warsaw. State’s misperformance such as corruption, incompetence, and the lack of responsiveness has been interpreted as reasons for citizens’ withdrawal from political participation. Furthermore, cultural dispossession induced by the elites may dissuade citizens from mobilizing for their material interests (Kalb 2009). The role of organizations and their forms of organizing in providing (or excluding) the voice of societal groups has been stressed by Skocpol (2004). Polish scholar and public intellectual, Agnieszka Graff, has criticized Polish civil society to have subordinated to the sponsors and the system. This form of civil society is characterized by technocratization and NGOization, which stands in stark contrast to the religious practices around the Catholic Church that have political character (Graff 2010). However, grassroots organizations and the orientation of the organizers can induce activation of marginalized citizens. I have described another example of organizations activating and channeling discontent into voice. They oppose party capture of civil society and NGOization. The organizations described in this paper have developed a new way of expressing their voice. The mobilization success in participatory oriented tenants’ organizations can be attributed to their belief in grass-roots mobilization and the inclusive approach. Their tactics are explicitly oriented on mobilization of excluded citizens. The example of mobilization for a demonstration during an organizational meeting in WSL illustrates that the dialogue between skeptical citizens and activists may re-frame the public perception of protest and equip citizens with new cultural references such as Swedish civil society and by doing this “re-civilize” political protest. Benford, R. D., and Snow, D. A. (2000): Framing processes and social movements: An overview and assessment. Annual Review of Sociology, 26, 611–39. Buchowski, M. (2006): The Specter of Orientalism in Europe: From Exotic Other to Stigmatized Brother. Anthropological Quarterly 79(3): 463–482. Ciszewski, P. (2008): Obrońcy praw lokatorów. Przegląd Anarchistyczny 8: 77-82. Collins, J. (2012): Theorizing Wisconsin’s 2011 protests: Community-based unionism confronts accumulation by dispossession. American Ethnologist 39 (1): 6–20. Della Porta, F. (2008): The emergence of European movements? Civil Society and the EU, European Journal of Legal Studies 1(3): 1-37. Gajewska, K. (2014): The Strategies of recent Polish Left social movement organizations: two cases of membership-poor organizations. Debatte: Journal of Contemporary Central and Eastern Europe 22(1): 103-126. Graff, A. (2010): Magma i inne próby zrozumienia, o co tu chodzi. Warszawa: Wydawnictwo Krytyki Politycznej. Grzegorczyk, J. (2008): Problemy lokatorskie w mieście doby globalizacji. Przykład Warszawy. Przegląd Anarchistyczny 8: 69-76. Halmai, G. (2011): (Dis)possessed by the Spectre of Socialism. Nationalist Mobilization in “Transitional” Hungary, in: Gábor Halmai and Don Kalb (eds) Working Class Populism and the Return of the Repressed in Neoliberal Europe. New York and Oxford: Berghahn Books, pp. 113-141. Ishchenko, V. (2011): Fighting Fences vs Fighting Monuments: Politics of Memory and Protest Mobilization in Ukraine. Debatte: Journal of Contemporary Central and Eastern Europe 19(1-2): 369-395. Jacobsson, K. and S. Saxonberg (2013): Beyond Ngo-Ization: The Development of Social Movements in Central and Eastern Europe. Ashgate Publishing. Kalb, D. (2009): Conversations with a Polish populist: Tracing hidden histories of globalization, class, and dispossession in postsocialism (and beyond). American Ethnologist 36(2): 207–223. Kopstein, K. J. (2000): USAID Assistance Program to Poland in Local Governmnet and Hosing Sector Reform: A History and Assessment from 1990-2000, USAID/Poland, Contract No. OUT-AEP-I-00-99-00040, TO 803. Leontidou, L. (2010): Urban Social Movements in ‘Weak’ Civil Societies: The Right to the City and Cosmopolitan Activism in Southern Europe. Urban Studies 47(6): 1179-1203. McAdam, D. (1988): Micromobilization Contexts and Recruitment to Activism. In Bert Klandermans, Hanspeter Kriesi, Sidney Tarrow (eds.) From Structure to Action: Comparing Social Movement Research across Cultures. Greenwich/London: JAI Press Inc., pp. 125-54. Norris, P. (2002): Democratic Phoenix: Reinventing Political Activism. Cambridge: Cambridge University Press. Ost, D. (2005): The Defeat of Solidarity: Anger and Politics in Postcommunist Europe. Ithaca: Cornell University Press. Polanska Vergara, D. (2014): Cognitive dimension in cross-movement alliances : the case of squatting and tenants’ movements in Warsaw. Interface 6(2): 328-356. Skocpol, T. (2004): Voice and Inequality: The Transformation of American Civic Democracy. Perspectives on Politics 2(1): 3-20. Snow, D. A., Rochford, E. B., Worden, S. K., and Benford, R. D. (1986). Frame alignment processes, mobilization, and movement participation. American Sociological Review 51: 464–81. The real life of law: Polish lessons on ..
Walgrave, S. and J. Verhulst (2009): Government Stance and Internal Diversity of Protest: A Comparative Study of Protest against the War in Iraq in Eight Countries. Social Forces 87(3): 1355-1387. Wolford, W. (2007): From Confusion to Common Sense: Using Political Ethnography to Understand Social Mobilization in the Brazilian Northeast. In Lauren Joseph, Matthew Mahler, and Javier Auyero (eds) New Perspectives in Political Ethnography, pp. 14-36. Interview Grzegorczyk, Interview with the three leading members of the WSL conducted on 11 September 2008 by Jakub Grzegorczyk and published in Przegląd Anarchistyczny 8: 83-89. Two activists from Warsaw Association of Tenants (WSL), interview conducted on 30 May 2012. Team of Left Alternative, interview conducted on 26 September 2009. Team of Committee for Tenants’ Defense, interview conducted on 19 November 2009. Activist in Committee for Tenants’ Defense, interview conducted on 21 November 2009. Leaders of Attorney Office for Social Justice (KSS), interview conducted on 30 May 2012. Observation in Left Alternative, 26 September 2009. Observation in Committee for Tenants’ Defense, 19 November 2009. Observation of eviction blockade in Warsaw, May 2012. The findings presented in this article were gathered while completing the project entitled “Reinventing the state from below: public governance and engaged citizenship in the recent disputes over tenants’ issues in Poland.” The research was sponsored by Budapesti Közép-Európai Egyetem Alapítvány. The theses explained herein represent the ideas of the author, but not necessarily the opinion of CEU IAS.